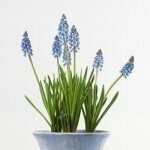 How can you control or get rid of grape hyacinths that have invaded where you don't want them? We have tried to dig them but they keep coming back. Really, the only way is to be diligent about digging them up. Remove any flowers that the remaining ones produce to keep seeds from spreading and when you dig them up, make sure you have gotten all of the bulblets that were attached to the mother bulb. You can spot treat with Round-Up or boiling water but be aware that both herbicides will kill any plant material it touches, such as surrounding grass or plants that it splashes on.